I’m relatively new to food blogging, so I’m learning as I go along. I’m used to making things on a whim when it comes to cooking, and everything usually ends up being pretty tasty, and sometimes even better than expected! But as it turns out, developing recipes for gluten-free baked goods is a whole other animal. The ratio of gluten-free flours (i.e., coconut flour, almond flour, cashew flour, etc.) to liquids (i.e. eggs, liquid sweetener, etc.) is not consistent across the board, and can vary wildly depending on what ingredients you want to use for a recipe. Normally, I typically just follow a recipe when I bake gluten-free treats and breads. But I wanted to create a brand new recipe for the blog, and to do that I need to experiment in the kitchen. After much trial and error, and several batches of cookies later, I think I’ve come up with a recipe that will not disappoint! This recipe for Cashew Butter Chocolate Chip Cookies tastes delicious, and has been a hit with all of my friends and co-workers. I’ve had several people tell me they couldn’t tell it was gluten-free/Paleo friendly, and that it just tasted like a delicious chocolate chip cookie. I’ve had requests to make several batches of these cookies, so be warned that if you take them to a party, you may have people wanting to become your best friend so that you’ll whip up some more. In a large mixing bowl, combine the cashew butter, egg and egg yolk, and vanilla extract, and stir until all of the liquid ingredients are well combined. In a separate bowl, mix together the coconut sugar, baking soda and sea salt. Add the coconut sugar mixture to the liquid ingredients in the large mixing bowl, and mix everything together until all of the ingredients are fully incorporated (you’ll need a little muscle to do this, but you want to make sure all of the ingredients are mixed throughly. You can do it!). Add in the chocolate chips, and stir to combine. Place dough on the parchment sheet, about 1 and 1/2 tablespoons per cookie. Don’t crowd the sheet with dough. 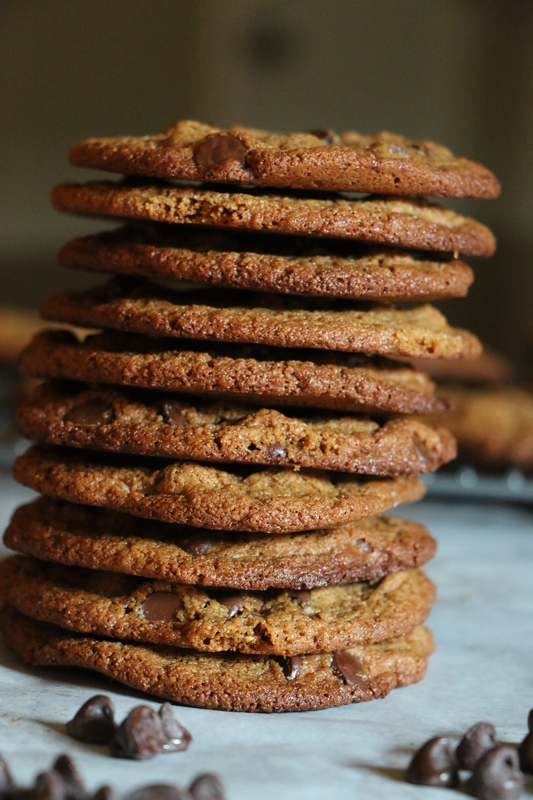 I would only do eight or nine cookies at a time on one tray, since the dough spreads on the pan while baking. Place in the higher rack of the oven, and bake for approximately 12 minutes. 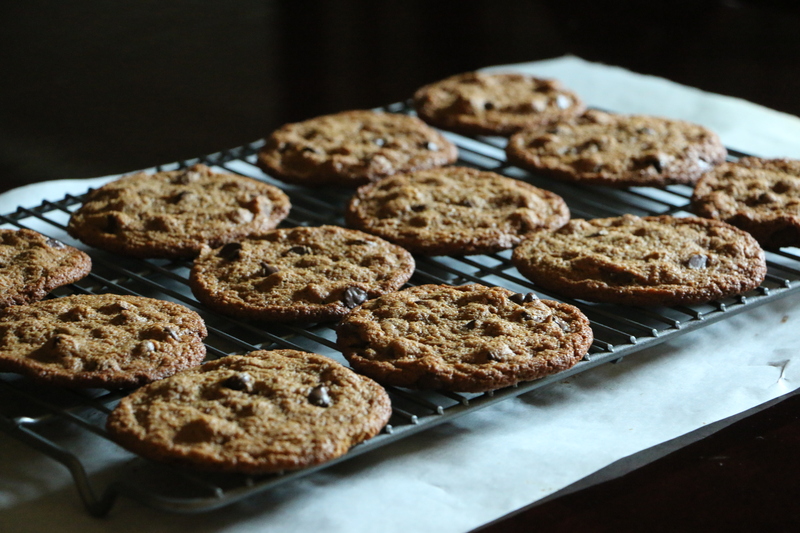 Take the cookies from the oven, and cool on parchment paper for at least 10 minutes before serving. 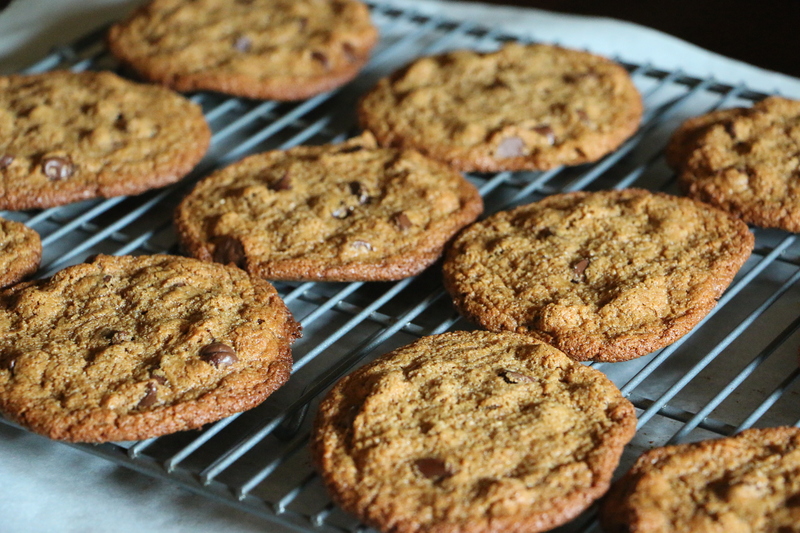 Tags: cashew butter, chocolate chip cookies, chocolate chips, coconut sugar, Gluten-Free, grain-free, paleo, Primal | Permalink. I find great baking inspiration on http://glutenfreeonashoestring.com Nicole has managed to figure it out, explain it simply, and produce beautiful baked goods.